Political action consists in showing as political what was viewed as “social,” “economic,” or “domestic.” It consist in blurring the boundaries. It is what happen whenever “domestic agents – workers or women, for instant – reconfigure their quarrel as a quarrel concerning the common, that is concerning what place belongs or does not belong to it and who is able or unable to make enunciations and demonstration about the common. Antonio Gramsci (1891-1937) is one of Marxism’s most important political theorists. For many decades, his theoretical legacy has been an important argument in the left’s strategic debates all over the world. The name of this Italian communist has become a “floating signifier” of sorts, capable of endowing “revolutionary” legitimacy even to those interpretations of his ideas that he himself would have called revisionist. Obviously, there is no way to avoid a procedure of historization: in other words, it makes sense to look at the historical context of his theoretical practice in order to understand and use his ideas adequately. Artiom Magun /// Take a Hold of Yourself! A Moscow apartment. 1 PM. Alexei is sitting in the kitchen, drinking coffee. Oxana comes out of the bedroom with her eyes half-shut. Oxana: Hi, Alexey. Listen, I don’t feel very well. And I also have a vague sense that something happened last night. Maybe it was a dream I can’t remember? Or you know, there are moments of rest and leisure when nothing happens but it seems like something in the world has turned upside down? Alexei: I know what you mean. But seriously, Oxana, you really don’t remember anything? Alexei:You really don’t remember how you threw a volume of Cicero at me last night? How you accused me of hating you, of suppressing your talents? You don’t remember how you cried for an hour? There is a distinction between fear and terror. Fear is an alarm in the face of danger, it incites a reaction. Terror, in contrast, is a different experience; it paralyzes those who experience it. Terror becomes internalized and is more effective than any prison. It confines us to living with panic as a lodger and provokes suspicious visions on the sight of what is foreign. The paranoid grimaces of the neighbour turn into an everyday theatricality. Time stops after the explosion. Something is happening with the calendar. A page is missing, silence. like the structure of an unfinished simphony. Sounds that explode from mobile phones. They walk among us, they watch us. The dogs come closer, they sniff the luggage. The men in black keep on walking. Now they head toward a group of foreigners that is us. Mobile phones, prepaid cards, sports bags, video tapes? Behind a desk one can see a map of the planet punctured with pins with different coloured heads. The image of the map resembles a doll used to cause something on a third party from a distance. The room is now empty. The map on the wall is still punctured. The world remains restless, while enormous bars rise around each being. A windup mechanism that will activate itself at a given time. The frailty of life in the face of movement becomes tangible. with cheap labour and information bricks. The globe turns around its axis, trying clumsily to dodge the clock’s hands. We are all Terrorists: That is the image. The figure of “terrorism” used as an element to justify war, genocide and repression against peoples. and generalized way non-Western societies and the regime’s opponents. torturing the “enemy,” humiliating them and cutting short any possibility of free life. Murdering somebody for “carrying a face”: shooting and seeing who it was only afterwards, turning that into an image. A unilateral, totalitarian, sensationalist, and effective image. The mass media weave an intersubjective network where insecurity is a war of all against all. Now simultaneously all of us read the same information, we all watch the same image. The upcoming Wars cover the future with a cloak of darkness. The tanks thirsty for fuel advance through the night carrying with them all the cultural stigmata from that “other side” of the world. homes, controlling the neuralgic points of the planet, mobility, transportation, communication. The message is in other languages but we can still read it: a terrorist image. “terrorism” for dominating and harrassing entire societies. the global market, is the future of this threat. But this will be another battle, a battle for Cultural emancipation. …The time has come to struggle for freedom..
And with more real ones if necessary! ETCETERA… is a collective founded by Federico Zukrfeld and Loreto Guzman at 1998 in Buenos Aires. Members are artists from fields such as poetry, drama, visual arts, music and political activists. ETCETERA is the commitment and presence in social conflicts and participates with its works, manifestos and actions in the protest demonstrations. And vows solemn enough for tears? Edward W. Said once stated that “what one feels is lacking in Foucault is something resembling Gramsci’s analysis of hegemony, of historical blocs and given relationships as a whole, constructed in accordance with the perspective of a politically active individual for whom the description of fascinating power mechanisms never becomes a substitute for the effort made to transform power relationships in society.” [E. W. Said: The World, the Text and the Critic, Cambridge (Mass) 1983]. If a reading of Gramsci in the light of current challenges is possible today, it is one that is able to relocate the general theory of the working class struggle to within a philosophical discussion of sovereignty and the paradigm of power in itself – the logic behind its construction and legitimisation, its sphere of influence and operation, and its complexity – and therefore in contrast with every reductionist theory of power as a mechanism of the dominant class according to the classical Marxist tradition. However, such a reading does not have to renounce the right to present itself an operational discourse, a theory to be used both for and in practice, one that does not limit itself to analysing and interpreting power, but works to change or negate it by means of political action. In post-Soviet intellectual and political space, the conception of multitude as a new form of social subjectivity has hardly been very fortunate. The problems in its reception begin with the very translation of the term itself: in the Russian edition of Negri and Hardt’s “Empire,” “multitudes” is mistranslated as “masses,” when this term was actually introduced, among other things, to mark an important difference in relation to the very masses it now invokes! It is also surprising to see that “Empire” has received such disparaging reviews from authors otherwise internationally known for their progressive views. For instance, in a rather irate review of “Empire,” Boris Kagarlitsky continues to apply the inaccurate term of “masses”: “From time to time, some kind…of abstract ‘masses’ appear on the pages of this book. We know little more about these ‘masses’ than about the absolute ideas of ancient philosophy” . This seems somewhat strange because Kagarlitsky himself has developed an exotic theory on the “revolt of the middle class”, connecting its revolutionary potential with the crisis of the social state and the development of new information technologies. However, Kagarlitsky hardly goes to the same lengths to construct new concepts as do Negri and Hardt. Furthermore, his figure of the “middle class”, no doubt, is heir to the category of the “people” as a unitary political body, whose predicate can be found in the state. In the early 20th century, the concept of the people-sovereign was carried over from the obsolescent plane of “political theology” to the socio-economic plane. A displacement of the same type also formed the political figure of the “middle class” as the basis of the late capitalist state. But is it really possible to recode this hybrid notion so that it might take the place of the (proletarian) “hegemon” in a new anti-capitalist strategy? 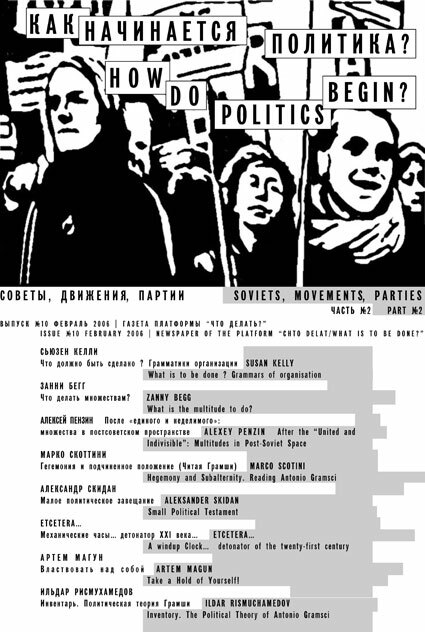 Even if such doubts arise concerning Kagarlitsky’s thinking, the general vector of his theory still runs in the same direction as that of Italian Marxist theorists in their search for subjectivity under the conditions of post-Fordist capitalism, which, perhaps, is why his rejection of Negri and Hardt’s work with the Spinozean term of “multitude” seems somewhat peculiar. Michael Hardt and Antonio Negri warn the reader, in the preface to Multitude: War and Democracy in the age of Empire, “this is a philosophical book…do not expect [it] to answer the question, What is to be done?” Despite this warning, however, that aching and persistent question hangs over their argument for the rest of the book. If Hardt and Negri’s central premise is correct, and the living alternative to Empire is now the multitude, this raises – as quickly as a reader of philosophical books can remind them of thesis eleven – a familiar question: does the concept of the multitude help illuminate how to bring to life this alternative? Or, to put it more directly, in the face of the war, brutality and injustice of Empire, what is to be done? Wh– question. Interrogative. Allows speaker to find out more information about topic. Wh- interrogative clauses often followed by to-infinitives with a covert subject.